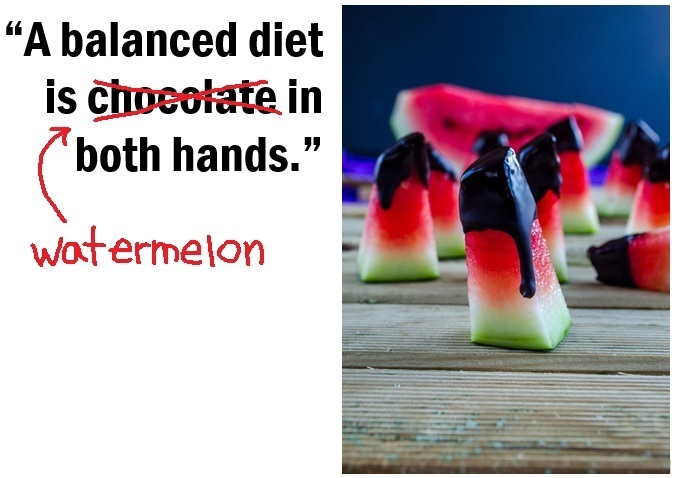 QUOTABLE WATERMELON: A REFRESHING BALANCING ACT - What About Watermelon? The quote in today’s entry has been written in many different ways with many different types of food. Today’s rendition uses chocolate, but I’ve seen it written with ice cream and even beer. Most of the time, the quote includes some sort of indulgent food, which is what makes the “balanced diet” claim so funny. Like I’ve written about in the past, watermelon has also been ranked number one on a list of fruits that pack the most nutritional bang for your buck. In other words, watermelon doesn’t just balance your diet, it can also be used to balance your budget! Watermelon dipped in Chocolate, two of my favorites, looks yummy. I agree, Ellen. The only thing that would make this better is if you added bacon…but I’m not sure how that would work!